The second largest city in France and the largest commercial port, Marseilles was once considered the gateway to the Mediterranean. Marseilles is cosmopolitan and vibrant, with its picturesque old port, medieval-village-style neighborhoods, downtown shopping and world renowned seafood. 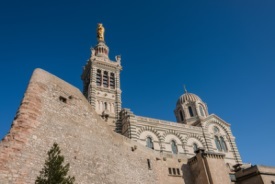 One can climb to 162 meters above sea level to visit the church of the patron saint of sailors, Notre Dame de La Garde. Or admire the cliffs that inspired Cezanne's "Estaque." Or visit nearby Treille to pay homage to the writer Marcel Pagnol. Marseilles' picturesque coastline beckons with beautiful beaches and opportunities for hiking, rock climbing, swimming and snorkeling. Exit junction 5 on the A55 (Gate 4 - La Calade - L'Estaque) for the Grand Port Maritime de Marseille. The information boards in the port after the GPMM control centre will tell you which quay your ship is on. Exit the A55 at junction 4 (La Joliette/Les Arnavaux/Arenc/Les Ports) for the Port de la Joliette (J4), at the foot of the Cathédrale de la Major. Port de la Joliette is on Quais de la Joliette (2nd arrondissement) in the Euroméditerranée area.